I remember walking into tack rooms when I was a young equestrian. The aromas were unmistakable— leather, saddle soap and a bit of worked-up sweat. Being there meant I had either finished up a hard day's work or was just setting out on an adventure, so when I walked into Ace Leather Goods' 4,000-square-foot studio, the smell of tanned hides brought me back. One of Ace Leather Goods' customers told Owner Andrew Gilkerson that Ace provided "the feeling of Nordstrom with the smell of a new Mercedes." I couldn't have agreed more. With the Gilkersons' new spacious store in Clinton, customers are sure to nod in approval. What is it about quality leather, whether it be a handbag or saddle, that says "luxury?" Maybe it's the understanding that behind each piece of handcrafted leather are years of hard work, an artisan's creativity and a whole big dose of pride. 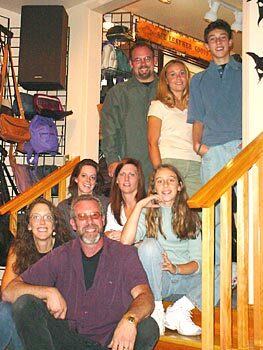 Although that summarizes Ace Leather Goods in a nutshell, it doesn't give a complete perspective as to how a family-owned business has become this state's leatherworking family, headquartered in Clinton. "I'm very picky about what materials I work with," said Andrew. "Leather is a very unforgiving medium so I only deal with quality." Andrew knows leather. For almost 30 years leather has been his trade, first in Seattle then in the San Francisco Bay area. When he was 16 he worked up to 90 hours some weeks because he couldn't get enough of the stuff, and by 1982, before he was out of his teens, he bought a wholesale leatherworking biz he helped create. Andrew and his wife Kathy, pride themselves on Ace Leather Goods' beginnings, and what their collective effort have brought them, especially the good fortune to have found a great, spacious location in Clinton. "We wanted to have a store geared toward the island," Kathy said. "We make Nordstrom quality goods for the average person. Every piece of leather is a unique piece of art." Andrew said that back in the 80s it was difficult to hand produce wholesale leather goods because large companies were forcing him to try and mass produce his products. "I didn't want to do that," he said. "We began working art shows." Today the couple attends 30 shows each year on average. They also have more than 5,000 screened email buyers, which means these people have an interest in Ace's products because they've seen them at shows or in the store, or are customers already. The Gilkersons' success comes from their team effort. Not only do they create more than 100 quality products, they are also responsible for selling and marketing their art. They are well respected in the community and by their employees, who are loyal and hardworking, and embrace the same philosophy of impeccable customer service. Andrew and Kathy both agree their team effort wouldn't be as seamless as it is without the hard work of Gretchen Odel, store manager, and Scott Moberly, who wears many hats throughout the process, but most importantly is a great salesman. Their products speak for themselves — hand-crafted handbags, luggage, belts and accessories. There are wallets with hand-carved wildlife scenes and buffalo nickels for snaps. Andrew's knack with creating braided leather belts from one solid leather piece has buyers seeking his belts from across the country. They recently added Textan saddles and Weaver tack to service the island's horse-friendly community. Although Ace didn't create these products, they are high quality. The Gilkersons even had custom saddle racks made of fine woods for display and purchase. If you need to fit a saddle, these racks will hold you without a doubt. If you need to peruse additional tack and saddles, there are catalogs on hand, and Tracy Nance, who recently received a degree in saddlery is on hand to help with repairs and leather customizing. There is ample parking at the Clinton store, and repairs can be made on-site. Ace Leather offers 4-H discounts, too.